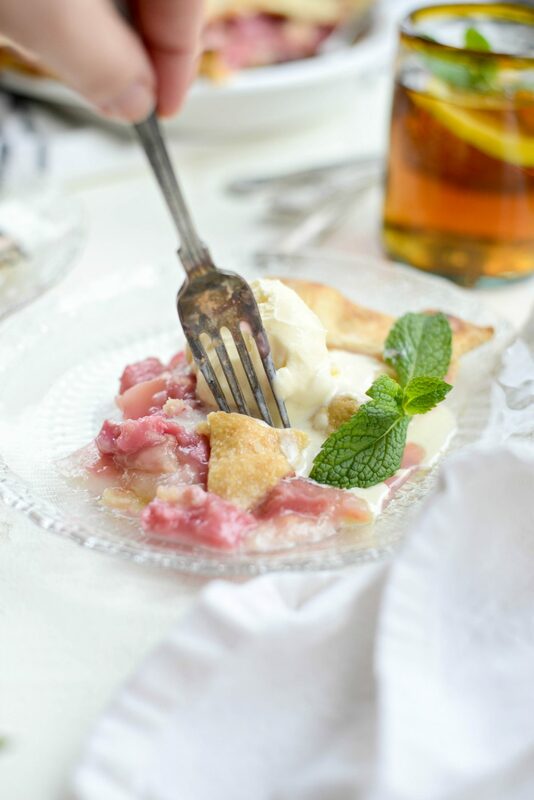 This classic Homemade Rhubarb Pie recipe is one that I have enjoyed since I was a kid (thanks Mom!). 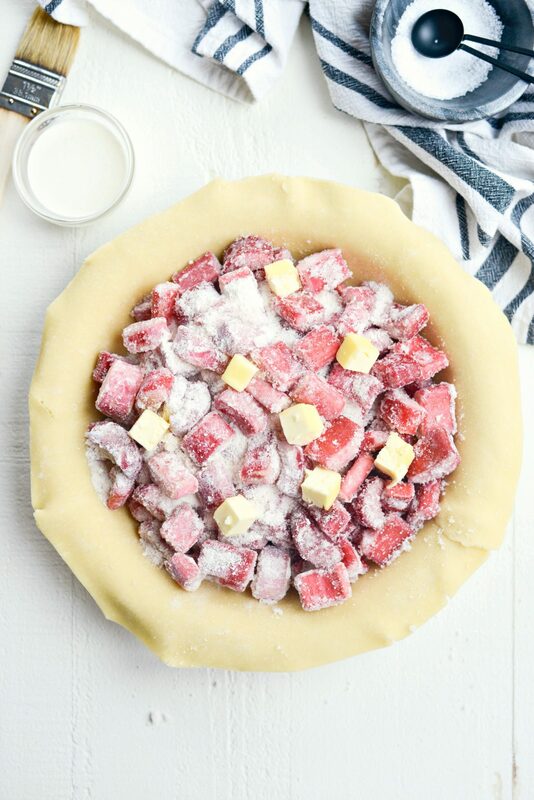 Homemade buttery and flaky pie crust with an easy rhubarb filling baked until golden and bubbly. 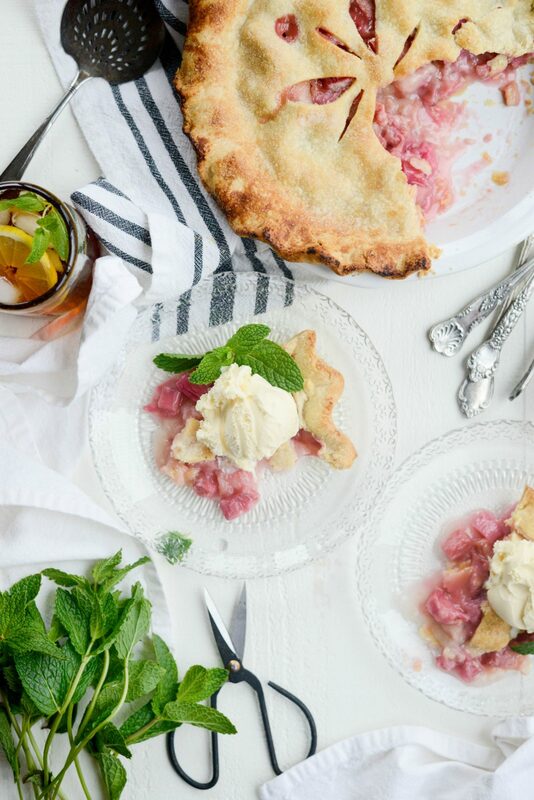 Serve with a scoop of vanilla ice cream and enjoy one of my favorite springtime pies! 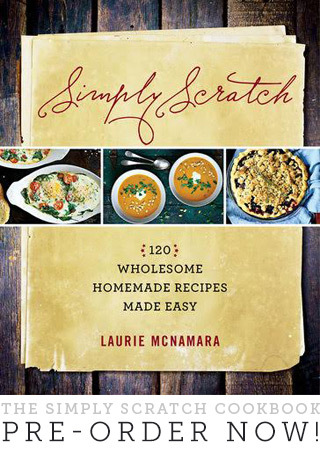 Makes one 9-inch pie in about 1 hour 30 minutes. 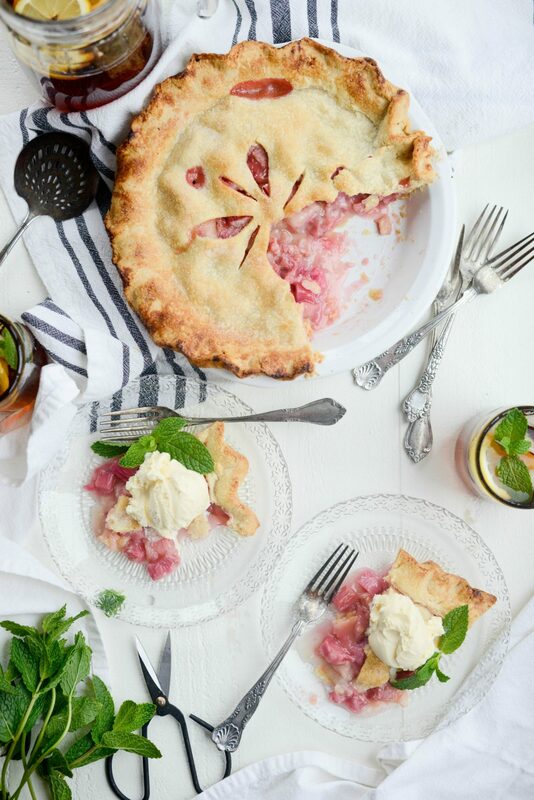 Does homemade rhubarb pie hold any special memories for you? 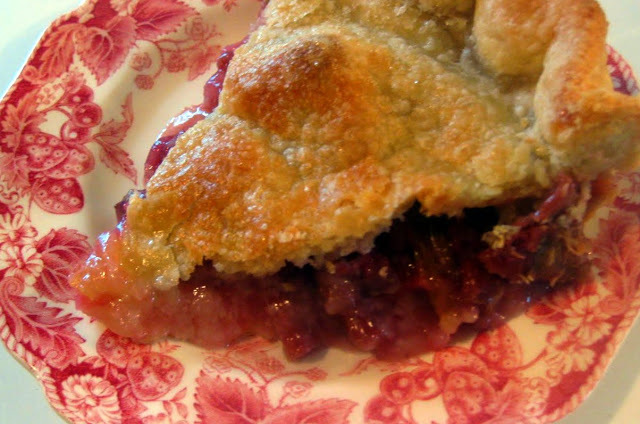 It seems anyone who likes rhubarb pie can tie it to a moment in their childhood, I know I can. 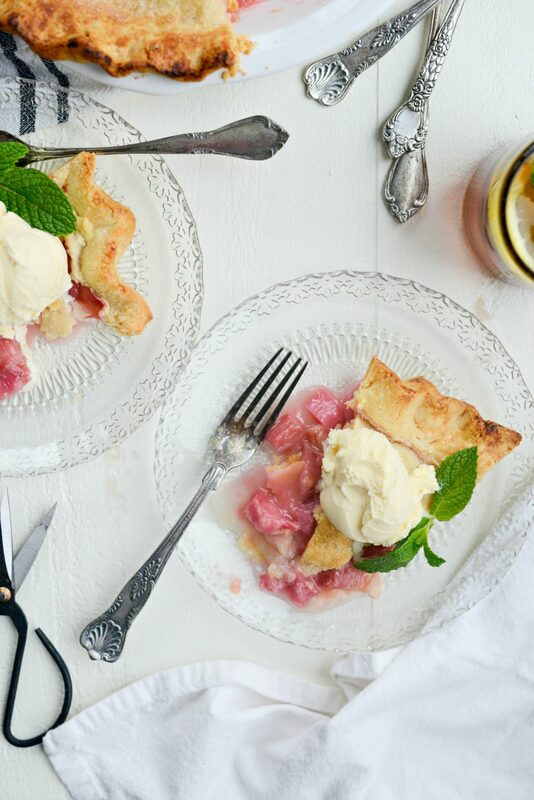 For me, the memory is of eating a slice of homemade rhubarb pie at the kitchen table in my childhood home, staring out of a huge picture window and looking out onto our big back yard. The garden to the left and my parents horses to the right, thinking ‘Wow! This is good strawberry rhubarb pie! and “Boy do I love strawberry rhubarb pie!! 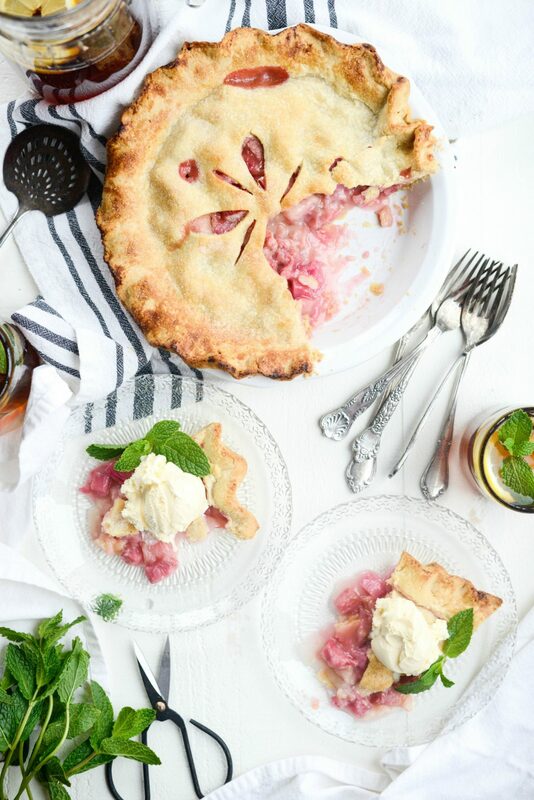 It wasn’t until recently when my mom graciously handed down her rhubarb pie recipe to me, and I read it closely, that I learned there wasn’t actually any strawberries in it AT ALL. All these years I thought I was eating strawberry rhubarb pie when it was straight up rhubarb! But hey that’s okay, it is still the best darn pie and after the first bite, it teleports me back in time. 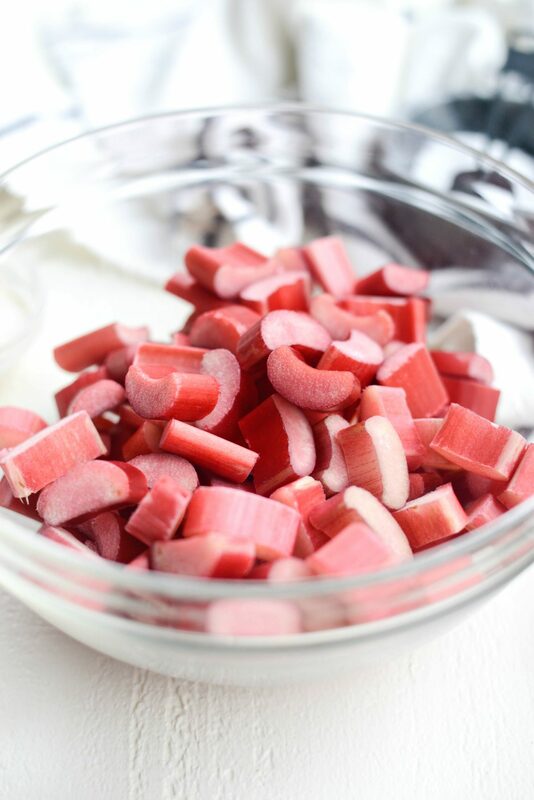 Fun Fact: did you know rhubarb is a vegetable? Ha! Me either. 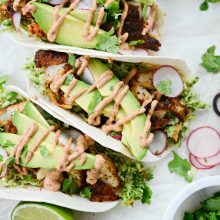 Just a little food trivia for ya . For this super spectacular pie, you’ll need pie crust. My recipe is pretty simple; only flour, salt, butter and water and with the help of your food processor, you will have a perfect flaky crust. 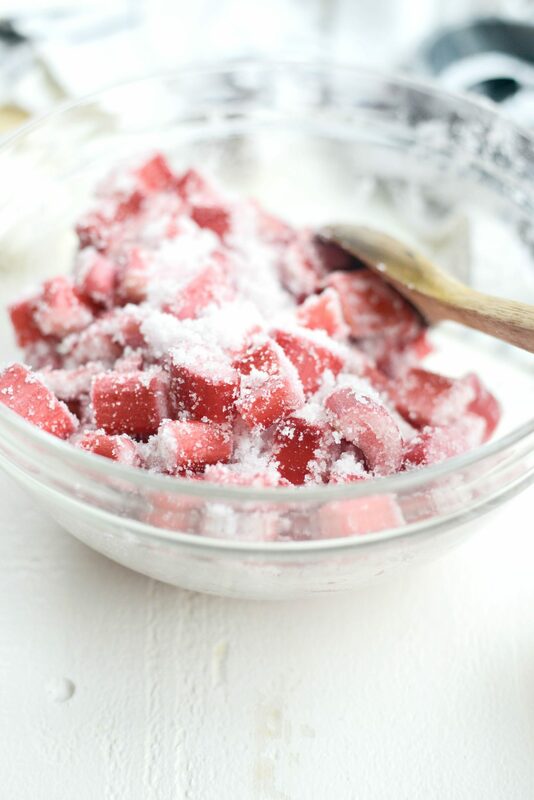 For the rhubarb filling, you will need 5 cups diced fresh rhubarb, 1 cup granulated sugar, 3/4 teaspoon kosher salt, 6 tablespoons all-purpose flour and 2 tablespoons cubed unsalted butter. You will also need heavy cream or whole milk for brushing the top of the pie dough and a little sugar to sprinkle over top before baking. And as a side note, I always roll out my top crust right after I roll out the bottom crust and keep them both chilled (one in the pie plate and one on a lined baking sheet) while I prepare the filling. Then I pull out the top crust a couple minutes before draping it over the filling so its not too stiff and easier to work with. First add 5 cups chopped fresh rhubarb to a large mixing bowl. Then measure and add in 1 cup of granulated sugar and 3/4 teaspoon kosher salt. 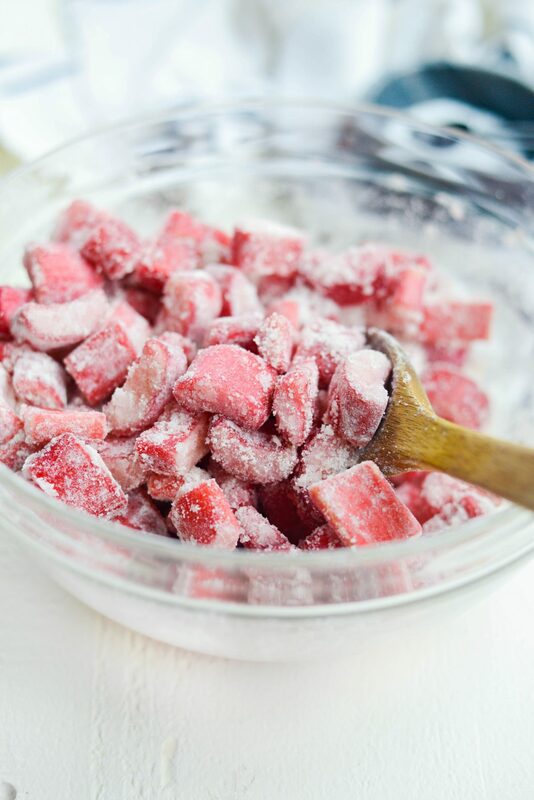 Toss to coat and set off to the side to let the sugar and salt draw out any juices in the rhubarb while move your oven rack to the lower third of your oven and then preheat it to 425°. Then, after about 10 minutes stir in 6 tablespoons of flour. Next, tip the rhubarb filling into the bottom pie crust. 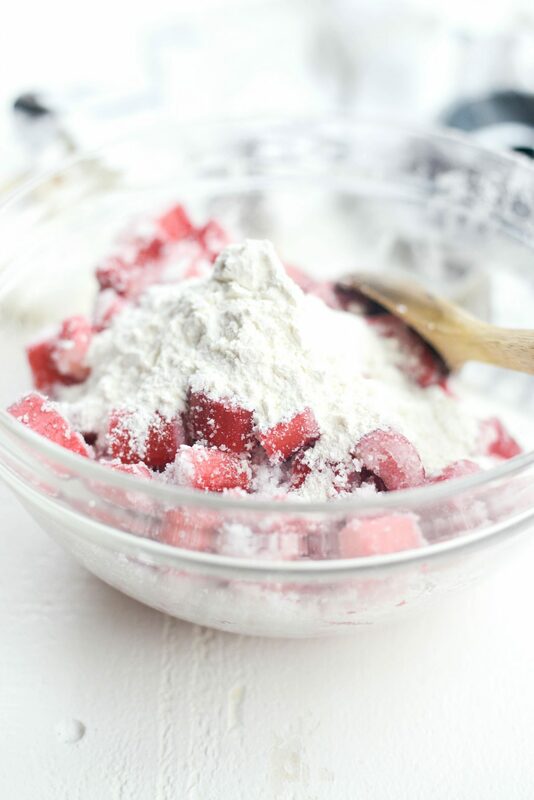 Don’t worry if you have some loose flour and sugar it will all thicken up when the rhubarb releases more of their juices during baking. Dot the top of the fruit with little cubes (2 tablespoons total) of unsalted butter. Drape the top crust over the filling, trim the excess dough and fold and crimp the edges. 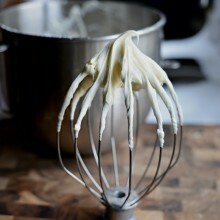 Next use a pastry brush and brush the top of the dough with heavy cream or whole milk. 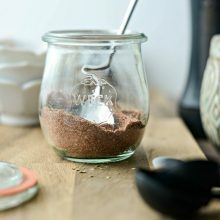 Sprinkle generously with granulated sugar before cutting air vents so steam can escape. 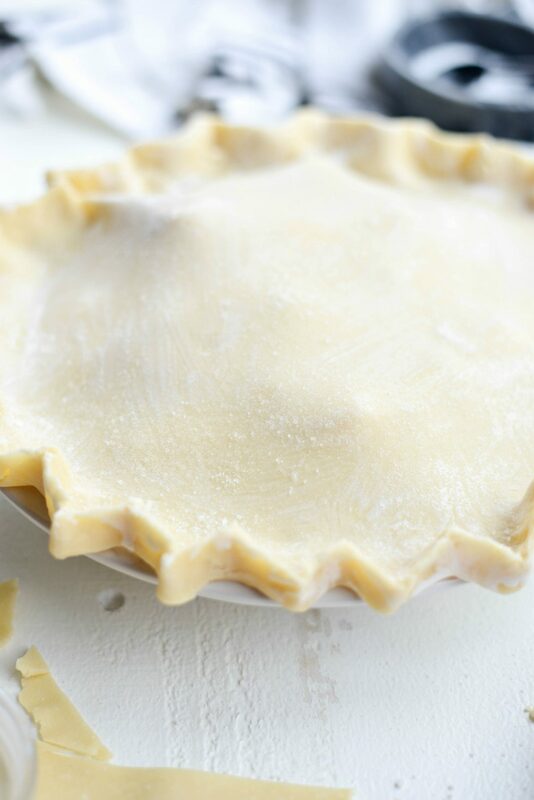 Place the pie onto a rimmed metal baking sheet and slide into a preheated 425° oven for 25 minutes. Remove and rotate the pie and reduce the heat to 350°. Continue to bake for an additional 25-30 minutes or until the crust comes out nice and golden and the filling is bubbling. 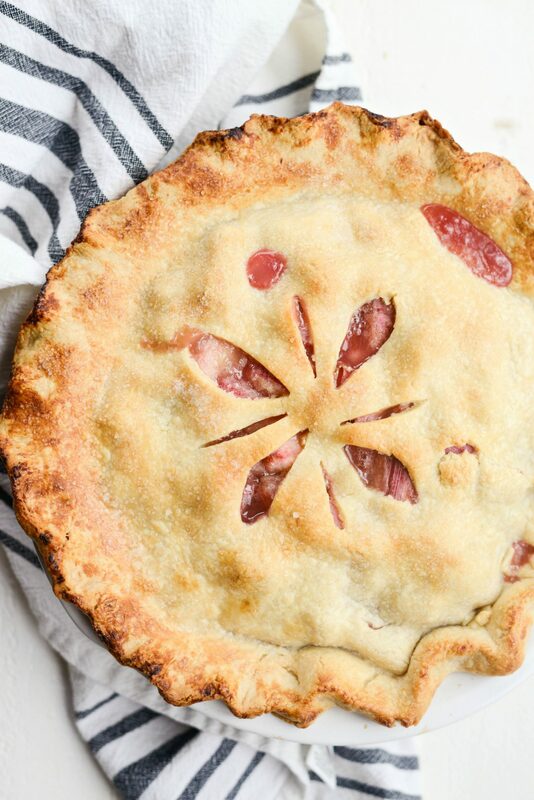 What a beautiful golden homemade rhubarb pie! It’s imperfectly perfect and sooo beautiful it’s almost too pretty to cut into. 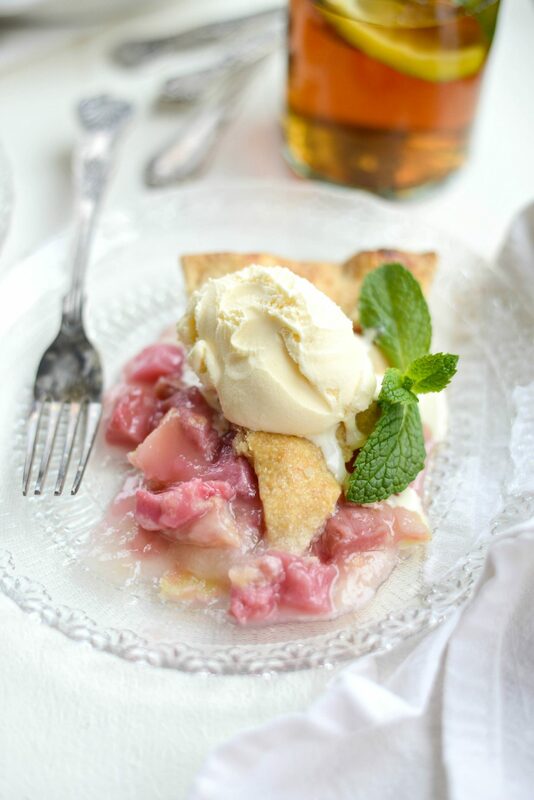 I top slices of warm homemade rhubarb pie with a generous scoop of vanilla ice cream. I think it’s the best when the ice cream melts into the filling. You get pieces of flaky crust, warm fruit and cool ice cream in one bite. So. Good! Enjoy! 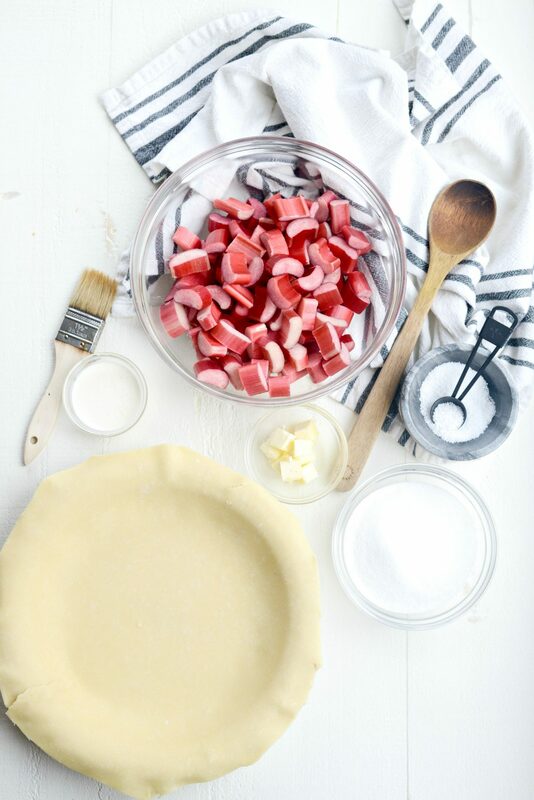 And if you give this Homemade Rhubarb Pie recipe a try, let me know! Snap a photo and tag me on twitter or instagram! 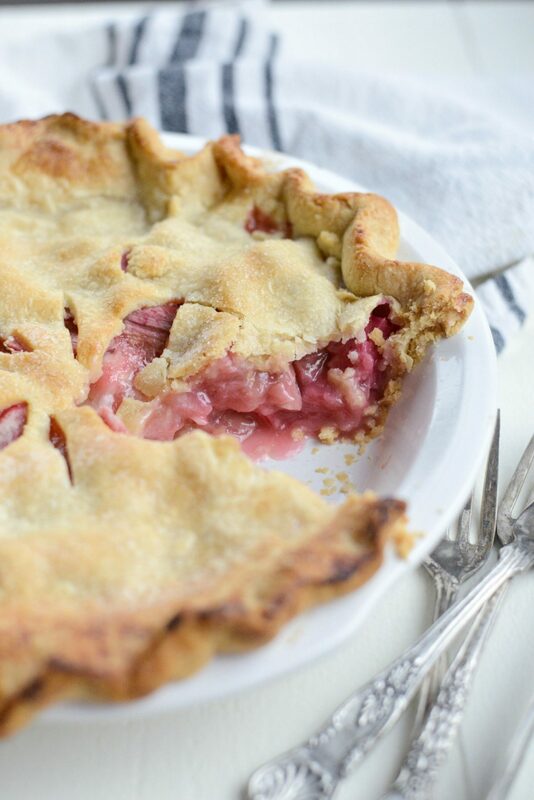 This classic homemade rhubarb pie recipe is one that I have enjoyed since I was a kid. 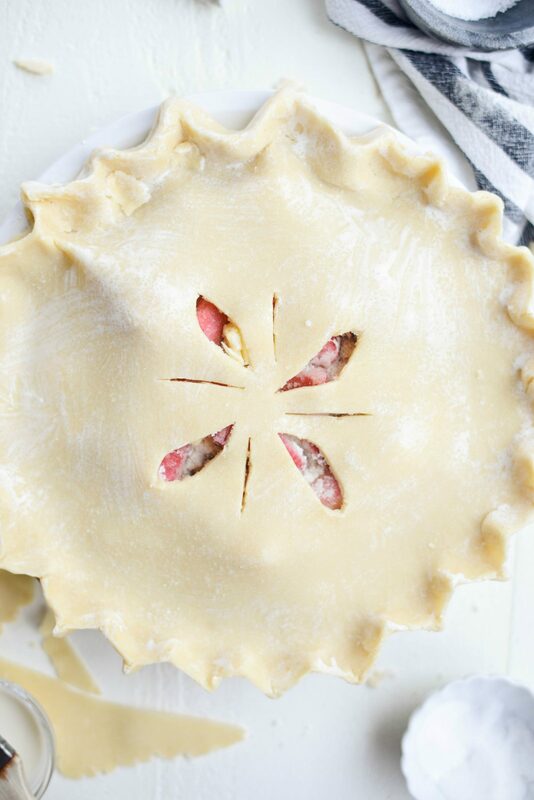 Homemade pie crust with a simplest rhubarb filling. My favorite spring pie! Position an oven rack in the lower third of your oven and then preheat your oven to 425°. Roll out the pie dough to fit a 9-inch pie plate, leaving a couple inches overhang. Keep chilled. 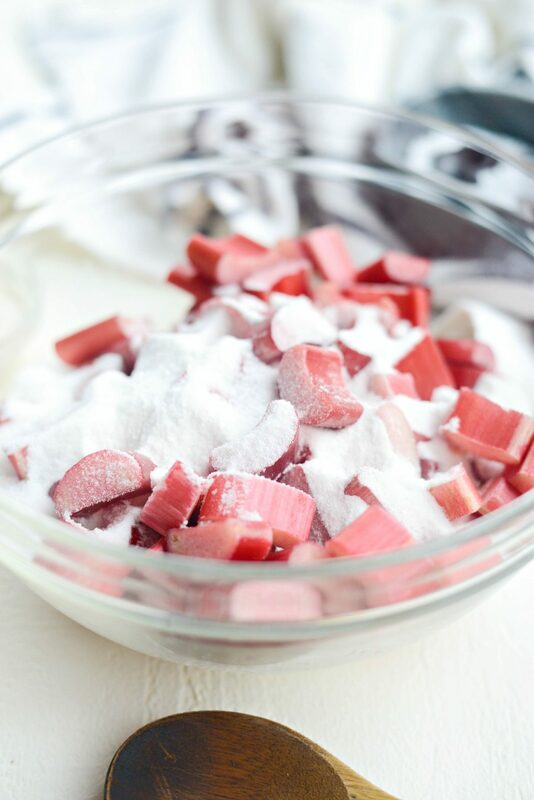 In a large mixing bowl, combine the chopped rhubarb with the sugar, flour and salt. Add the filling to the bottom prepared crust and dot with the butter. Drape the top crust over the filling, trim the excess dough and fold and crimp the edges. 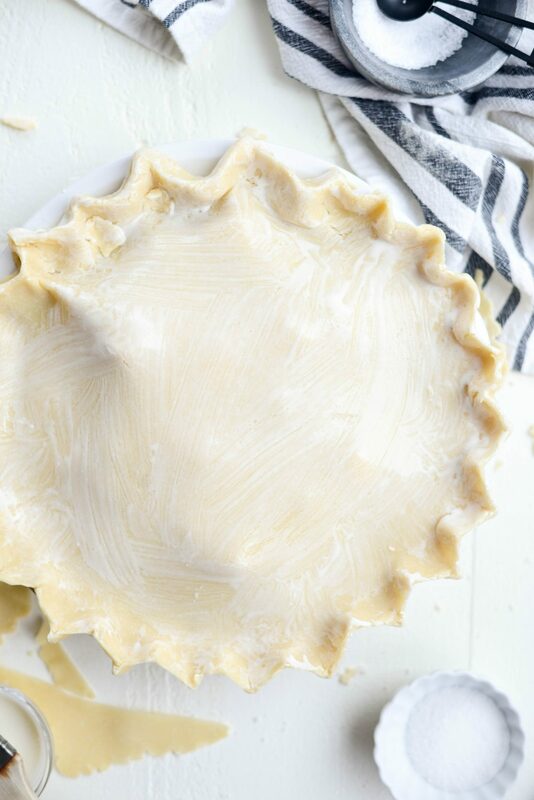 Brush the top of the pie crust with milk or heavy cream and sprinkle with granulated sugar. 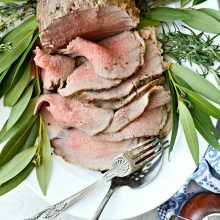 With a paring knife, make slits in the center so any steam may escape. *If the edges of the pie crust are getting too brown too fast, take a sheet of aluminum foil and fold in half width-wise. Cut out a large have circle and then unfold to reveal a perfect circle. Cover the pie with the foil, you'll see that the edges are protected while the open center with allow the middle of the pie to continue to brown. I've never used the food processor to do pie crust. I shall have to try that. And of course, the coldest of cold ingredients. But now youa re making me drool, and I am just here to test yoru comment form. I wonder if my rhubarb plant is still growing. A picture of this popped up at the bottom of today's post and I had to come over to check it out. 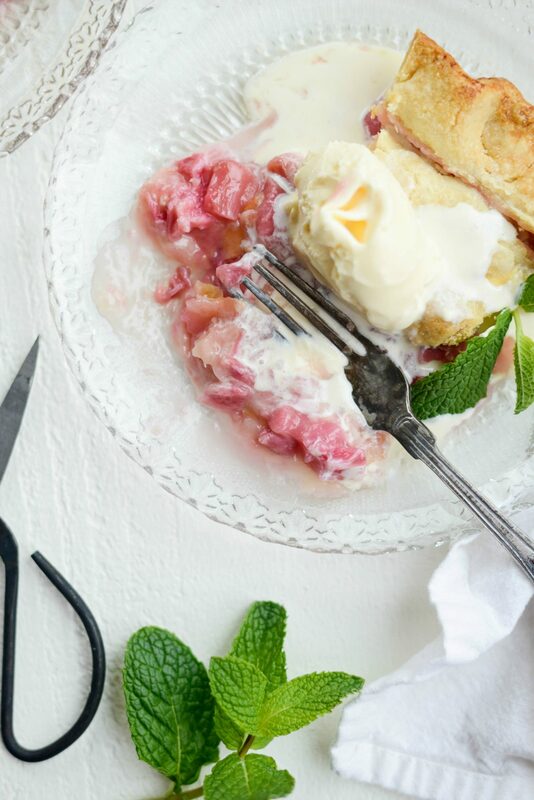 I love, love, love rhubarb and can't wait for it to be back again. I just pulled a bag out of the freezer the other day to make some jam to tide me over till spring. I have these plates. They were my grandmas and she made the best rhubarb pie and served them on these plates : ) Thanks for the happy memory this morning! 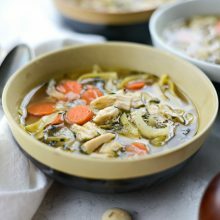 Unconfuse me please and print the amount of ingredients for the crust and base. I think your pie looks beautiful can’t wait to try it. I love rhubarb. 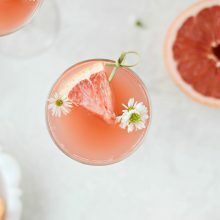 I think I will add strawberries only because I love them. Thanks for sharing this.